NuWorks is a relatively new brand of online casino software. While NuWorks is based on the RealTime Gaming online casino software that has been a staple of the online casino landscape for many years, NuWorks is much more. The main difference is that most of the online slot machines from NuWorks have a “Feature Guarantee” feature. The “Feature Guarantee” ensures that you will be awarded one of the bonus rounds or jackpots within a certain number of spins. This enables you to better plan how much longer you want to continue playing a slot machine, since you know that you’re certain of getting that bonus round or jackpot that you’ve been chasing! Here are the five newest online slot machines that have been released on the NuWork online casino software platform. These slots are only available at one online casino — BuzzLuck. And what’s even better is that Buzzluck is a 5-star rated online casino, and is open to nearly all players from around the world. (Sorry — Netherlands Antilles, Costa Rica, Israel, France, or the Town of Markham in Canada). Get ready to hit the road and enjoy your ride with Big Rig, the shiny new 25 line slot from Nuworks.BIG and RIG are grouped wilds, and when both of them appear the feature is triggered! You get to choose between 12 free games and 7 re-spins, and whenever BIG or RIG appear in the free games each will award an added bonus of up to 10 times your bet. There is also a great new feature incorporated into Big Rig – Boiling Point Jackpots! These two meters add nail-biting excitement with a steam gauge and “must-trigger-by” value on display for extra pressure! Burn some rubber and get in quick to play Big Rig! A fierce aquatic battle rages amidst a glittering coral reef in this fresh and colorful slot from NuWorks, Duel in the Deep. Swordfish & Sumo Fish are Wild symbols, and will trigger the Fighting Fish Feature when matching symbols appear on reels 1 & 5. Pick your champion fish and wage an underwater assault to try and increase your free game and prize multiplier. The unique Win-Win system ensures that even the smallest feature wins will be transformed into a pearly prize, leaving behind the days of frustratingly unrewarding free games. Duel in the Deep also incorporates the new Boiling Point Jackpots Feature. These jackpot meters each have a nail-biting ‘Must-Trigger-By’ value on display, adding to the excitement of this entertaining new game. The classic tale takes on an unusual twist in this light-hearted cartoony slot, Moby Duck.Win up to 50 free games and enjoy a top 5 of a kind prize of 10000 times your line bet. Whenever Moby Duck appears on Reels 1 and/or 5 in free games, he will move across the other reels and transform all Ship, Captain and Harpooner symbols into Moby Duck Wilds! This game also offers the unique patented Win-Win Feature, which insures that even the smallest Feature wins will be transformed into a worthy prize. Keep an eye out for a crafty junkyard pooch and his artful associates, turning trash into treasure in Watchdog, the latest slot from NuWorks.The Watchdog is a Wild symbol, and 3 or more will trigger the feature. The devious dog will offer players a pick from his suspicious stash of watches, to award free games with prizes up to x 12. The unique Win-Win system ensures that even the smallest feature wins will be transformed into a worthy prize, leaving behind the days of frustratingly unrewarding free games. Watchdog also includes the Jackpot Pyramid feature, allowing players the chance to climb to the top of an ancient Mayan pyramid to win one of 5 progressive jackpots. Increasing the Jackpot Pyramid bet will improve your odds of triggering the Jackpot Pyramid, up to an incredible chance of 1 in 6 spins! 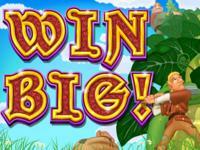 Revisit your story-book roots and climb the beanstalk to find giant prizes in Nuworks Gaming’s new 25-line slot game, Win Big!10 free games are awarded when “WIN” appears on reel 1 with “BIG” on reel 5. During these free games all 2-of- a- kind prizes are doubled, all 3-of-a-kind prizes are tripled, all 4-of-a-kind prizes are quadrupled and all 5-of-a-kind prizes are quintupled! Win Big also features a mini, minor and major random jackpot which can be won at the conclusion of any paid spin!